Can you buy baths under £200? WYB takes a look at bathtubs available on a £200 budget! Posted By Alan, 13th Oct 2016. 3 Minute Read. When you’ve had a tough day, nothing beats a hot soak in the tub to help soothe aches and pains and relieve those built up stresses. So, in this week’s ‘What’s Your Budget’ (WYB) feature we take the plunge and look at 5 baths under £200. What’s your budget for a bath? Can you buy a bath for less than £200? WYB finds out! When we talk about baths it could literally mean anything because there are so many varieties out there. We’re not talking about the beautiful place Bath and we don’t mean public baths and swimming pools, we’re talking regular ol’ bathtubs. Not the fancy freestanding types, expensive natural stone or cast iron styles, just what we refer to as standard baths, you know, the ones we generally find in most bathrooms. Baths can be one of the most expensive items that make up a bathroom suite and buying one for less than £200 can sometimes leave you limited. Before you buy a bath it’s a good idea to measure your bathroom first, if you’re installing from scratch, or take the measurements of your old bath to get the best sizes if you’re replacing a like for like size. Once you have the bath sizes you require and a good idea of how much you want to spend on a new bathtub you’re pretty much ready to go. A couple of things to note are that most baths don’t come with bath taps and these can add to the overall cost of your bath. It’s worth checking out which taps will fit into your budgeting plans before heading straight for a bath you think will look fab in your bathroom. Taps can really enhance the look of a bath so choose wisely and you’ll end up with a really stylish bath complete with taps on a smaller budget than you thought possible. Another thing that may not come with your bath is bath panels. These hide the underside of your bath from the front and sides and give it that finished look. These vary in price, style and quality so make sure these are in your budgeting plans too. Are there baths within a £200 budget? There is a great selection of budget baths under £200 which we have listed below. Whether you just want something to fill a space or would like a nice bathroom feature we have something for you in this list. We believe that these 5 baths represent excellent value for money, quality build and style but the list is in no particular order. 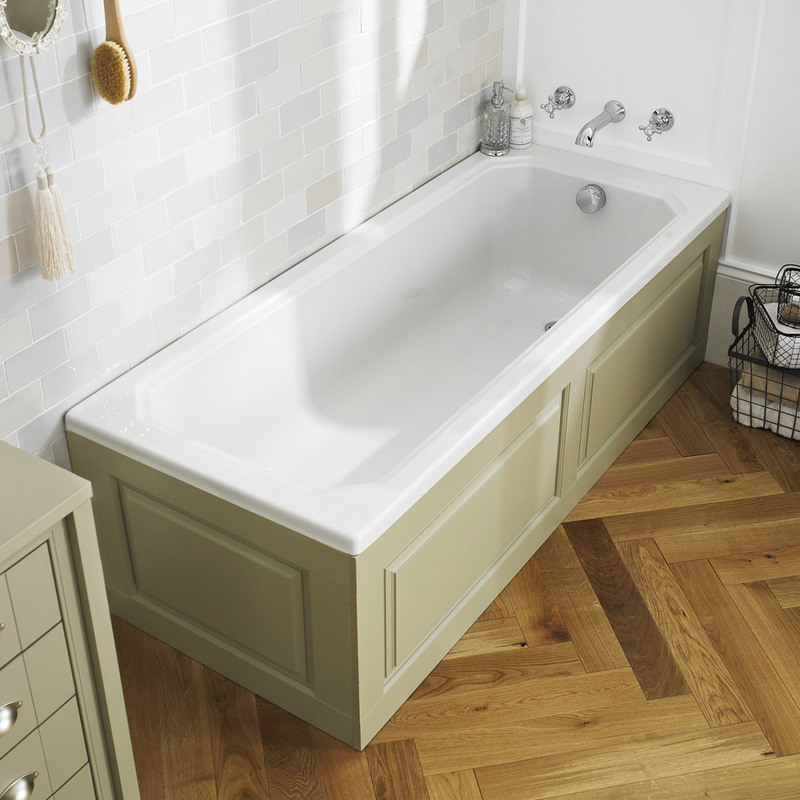 The Sutton double ended bath is a fantastic example of value for money. This stylish bath has proven very popular due to its minimalist design and contemporary feel. It comes with a 25 year guarantee so you know it’s great quality and the double ended style means two can share without one person suffering the dreaded ‘back to taps’ scenario. What could you buy with the change? 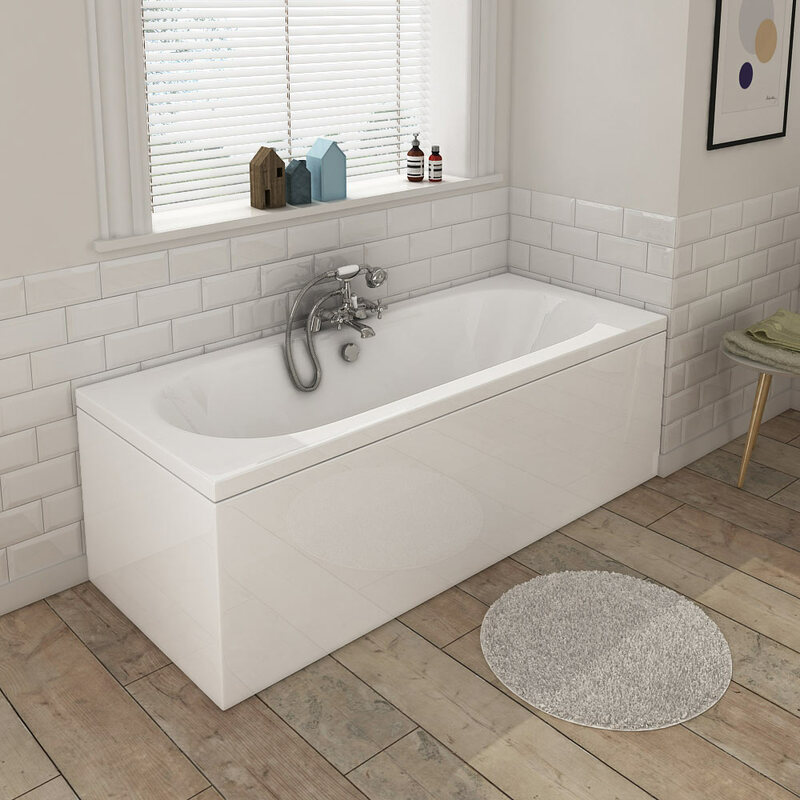 This bath comes in well under £200 which means you still have a large amount of your budget left over to buy bath panels to finish off your bath in style! The stunning finish of the Barmby single ended bath is a real wow factor and instantly draws your attention to its presence. It has bath taps situated at one end which really allows the look of the bath to breathe. The ergonomic design boasts luxurious comfort and the high quality build is backed by multiple guarantees to ensure total satisfaction. This bath also comes with the bath panels included! What could you buy with the change? The cost of this bath is less than £200 which means you will be able to buy a set of beautiful bath taps like the Neo minimalist pillar bath taps with your change. Not only does the Banbury cost less than £200 but, you could also buy this bath with a £100 budget too. Just don’t let the extremely cheap price fool you into thinking this bath is not great quality! Its simple design allows it to fit seamlessly into almost any modern bathroom design and it’s made in Britain to high standards backed by a long guarantee! What could you buy with the change? With over £100 in change from your £200 budget the Banbury bath will allow you to purchase taps like this Apollo bath filler and these Hudson Reed end panels too! An Old London bath for under £200 may sound a bit far fetched but it really isn’t! Known for top quality build and stylish period designs Old London have really packed everything into this single ended traditional bath at a super-low price. These uniquely styled bath panels finish off the look perfectly and create a real centrepiece within any period or art deco styled bathroom. What could you buy with the change? With a large amount left over from your £200 budget you could invest in this easy clean click clack bath waste! 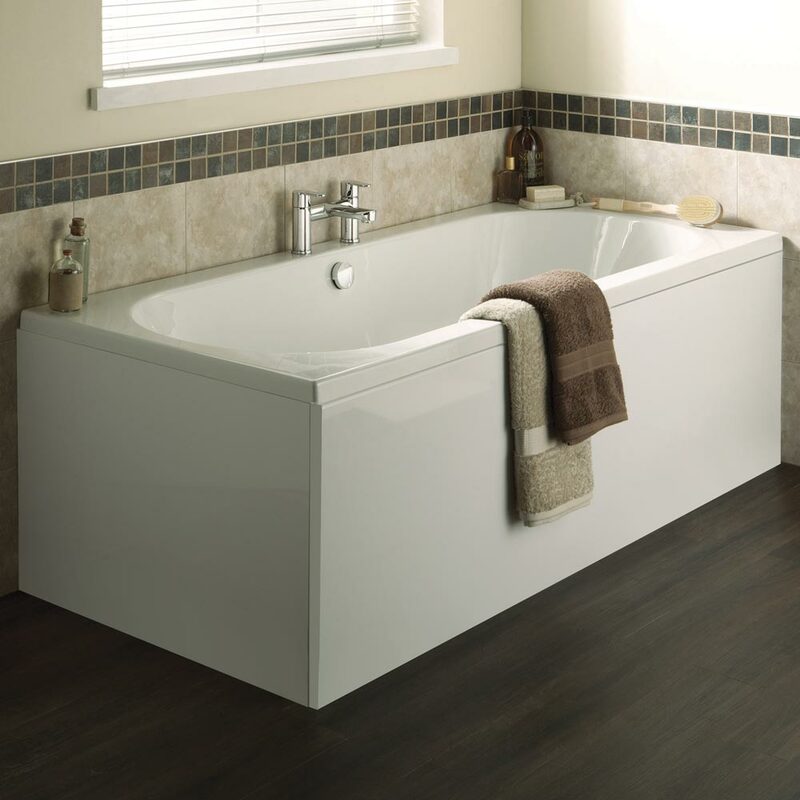 Get a wonderfully modern bath with the Premier Otley. High quality build and practicality make this bath one of the best you can buy for under £200. It comes with front and end bath panels which means you don’t need to splash out on those and the 25 year guarantee will surely put your mind at ease as you soak away the stress! What could you buy with the change? You can buy a bath waste with the spare change from your budget. There are lots of bath plugs and wastes to choose from. What will your bath budget do for you? If you have a budget of £200 for a bath you’d expect to be limited on both choice and quality. 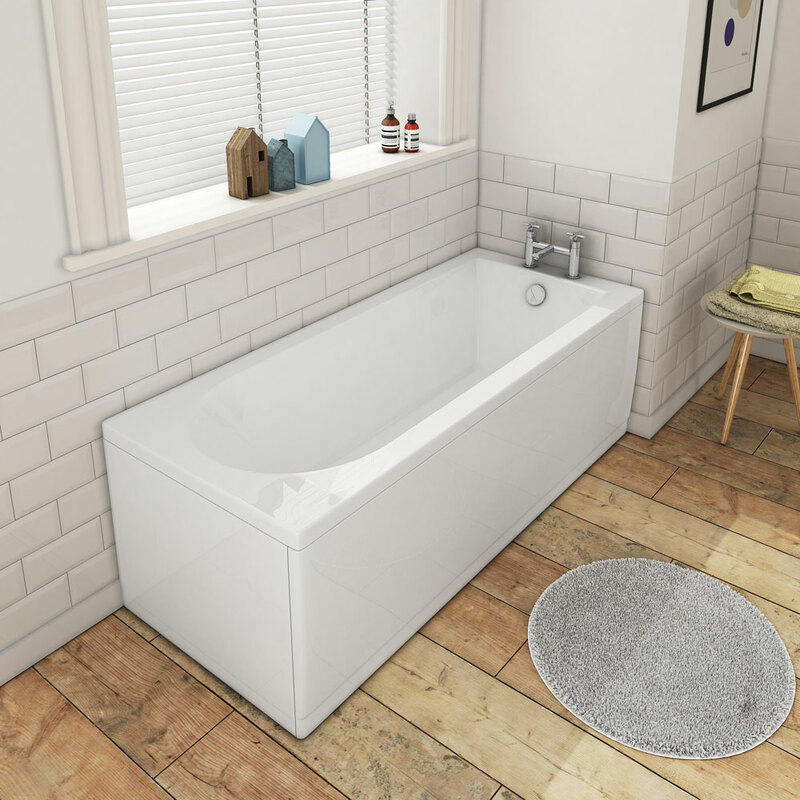 The reality is, although you can pay thousands for a bath, there are lots of baths in all shapes, styles and sizes to choose from under £200 which are built to last and designed with style in mind. The above options show that no matter the style, be it traditional, art deco or contemporary there is something for everyone’s budget. As with anything though, you will have to look for bathtubs which include such items as bath panels, taps and wastes to complete the look and function of your bath; and will need to be factored into your budget if you want a complete bath under £200. This article has picked baths for your budget and hasn’t factored in the cost of additional parts but, we have tried our best to complete each bath with money left over from your budget. We hope you enjoyed this week’s WYB feature and find it useful when you’re looking for a bath on a budget. If you have any suggestions, feedback or questions please leave a comment in the comments section below. If you know a friend who may benefit from this feature please feel free to share it with them via email or social media. Get Ready For Our Brand New TV Advert! September 2016 sees the triumphant return of our flying vans.